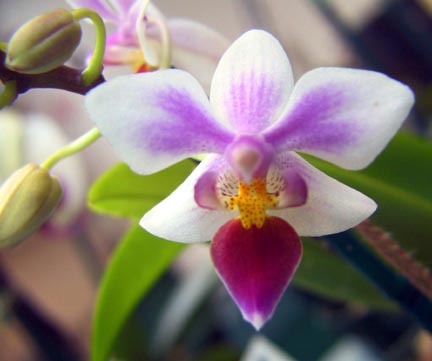 ANA Export Company, CA - California's leading wholesaler and online retailer of orchid plants. Andy's Orchids, CA - New Site! Argus Orchids, DC - Select Seedlings/Divisions for Sale, Specialzing in Slipper Orchids! Asuka Orchids, CA - Specializing in cool growing orchids! Bayou Orchids, FL - seedlings, mericlones, divisions, & stem props! Robert Bedard Horticulture, CA - Pursuing excellence in Phalaenopsis; continuing Herb Hager's lines. Bergstrom Orchids, HI - Home of Sibelius the Cat! Big Island Boutique, HI - Fresh Tropical Flowers! Big Leaf Orchids, TX - Phalaenopsis Plants For Sale/Trade! New List! Birdrock Tropicals, CA - Orchids & Companion Plants! Bloomfield Orchids, NY - Specializing in Fine Paphs & Phrags! Blue Pagoda & Evolution Orchids, FL - Seed Production of species & hybrids of many genera! BuyAnOrchid.com, NY - Beautiful Orchids and Gifts! Cal-Orchid, Inc., CA - Check our site for brand new updated information. Camp Lot A Noise Tropicals, FL - Primarily Species! Carmela Orchids, HI - Orchids sent worldwide to wholesale & retail customers! Carolina Orchids, SC - Bulbo's, Pleuro's, Maxillaria's, Lycastes, Angrecoids! Carter and Holmes Orchids, SC - Fine orchids for over 60 years - we ship worldwide from our 18 commercial greenhouses. Casa de las Orquideas, CA - Cymbidiums! Cattleya.us - Specializing in fine Cattleyas of course! Chadwick & Son Orchids, Inc., VA - Now available: our new orchid video! And see our Orchids at the White House! Clackamas Orchids, OR - Specializing in Species & Unusual Hybrids! Coastal Gardens, TX - Heirloom Orchid Divisions, antiques of the Orchid World! Cyp. Haven, IA - Hardy Terrestrial Orchids! DeValmont Orchids - Superior Slipper Orchids! Discover Orchids - We are growing for you! Dragon Agro Products, NJ - Wide selection of Orchids, Bonsais and Carnivorous Plants! E. F. G. Orchids, IL - Complete List! Elmore Orchids, TN - On-line Catalog, Cultural Info, Etc.! EnLightened Orchids, IL - Specializing in orchids suitable for under lights and windowsill culture. Everglades Orchids, FL - Specializing in "Warmth Tolerant" Cymbidiums and Oncidiinae! Exotic Orchids of Maui, HI - Maui's Premier Source for Orchids! Updated Weekly! Fantasy Orchids, Inc., CO - Wide variety of Hybrids and Species! New orchid DVD available! First Rays Orchids, PA - Orchids, supplies, and much more. Secure online ordering! Flasks by Chuck Acker, WI - Specializing in Paphs and Phrags! Florida SunCoast Orchids, FL - "Orchid Quality and Variety from Florida's SunCoast"
Flower Delivery Flowers - Links to Flower delivery and flower facts! Fox Valley Orchids, Ltd., IL - Specializing in Paphs. and Phrags. (Checklist Updated Monthly)! Gold Country Orchids, CA - Miniature & Compact Catts & Phals! Goodwin Orchids, FL - Specializing in Vanda orchids from Thailand! Gore Orchid Conservatory, CO - Phaphs, Phrags, Disas and Others! Gunter's Greenhouse Inc., TX- Largest Orchid Collection in North Texas! Gypsy Glen Orchids, PA - Ecuadorean species, imports! H&R Nurseries, Inc., HI - price lists and photo catalogs! Ha`iku Maui Orchids, Inc., HI - Specializing in orchids that are easy to grow and bloom in the home, Plus! Hausermann's Orchids, IL - One of the World's Largest Orchid Ranges! Hawaii Orchids, HI - Exotic Hawaiian orchids, gift arrangements or plants! Hawaiian Magic Tropical Flowers, HI - Orchid Plants, Lei & Tropical Flower Gift Boxes! Hillside Nursery, MA - Species & Hybrid Cypripedium Ladyslippers! Hillsview Gardens, OR - Specializing in Masdevallias, Miltoniopsis, and Pahpiopedelum. New Spring 2004 color catalog avail. online & as download! 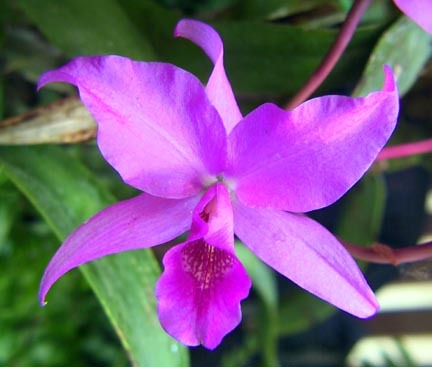 Huntington Beach Orchids, CA - Specializing in high quality Cattleyas, Laelia anceps & hybrids, & reedstem Epidendrums! Ironwood Estate Orchids, NC - Quality orchids - Phals, Cats, Den, Onc, Vanda, & others. It's A Jungle Nursery, TX - Orchids, Roses, Citrus, Agaves, and other exotic tropicals! J & L Orchids, CN - Unusual Species, Miniatures, Masdevallias! 2007 Listing! JA-RO-CA Enterprises, CA - Flasking Cabinets & All Types of Orchids! Jewell Orchids, GA - Cattleyas, Oncidiums & Species! Jungle Paradise, PA - Orchids & Other Tropical Plants! Kaleialoha Orchids, HI - Tropical flowers, Quality orchids, Anthuriums, Oncidium & Dendrobium! Krull-Smith, FL - Shop Our Newly Designed 2003 Online Catalog! Main Street Orchids, PA - New to Mall! See our GET ACQUAINTED offers! Marble Branch Farms, SC - Quality 'mini' and compact cattleyas, unique hybrids! Marriott Orchids, NC - Select Paph Species and Hybrids! Marlow Orchids, NY - Oncidium, Paphs, Phals, Zygos, Cymb. Species & Supplies. Mention Saw on the Orchid Mall - Get 10% Off! Meke Aloha Orchids, FL - Specializing in Schomburgkias and Schom. hybrids! Mike's Orchids and Tropicals, NC - Leasing of Quality Dendrobium & Phalaenopsis Orchids. Miller's Tropicals, FL - Specializing in Tropical and Vandaceous Orchid Species! Mount Prospect Orchids, NY - Paphs, Phrags, Bulbophylums, Species! New 2006 Price List! Natt's Orchids, IL - Specializing in Vandas, Ascocendas, Rhynchostylis, Dendrobes, Oncidiums, and Alliances! New World Orchids, MI - Many forms of Neofinetia falcata & Dendrobium moniliforme from Japan, plus Orchid Species from the Andes! Norman's Orchids, CA - Online Catalog & Order, Update Monthly! Oak Hill Gardens, IL - Quality Orchids, Reasonable Prices! Odom's Orchids, Inc., FL - Check out our 2007-2006 catalog for the latest in top quality cattleyas, phalaenopsis, etc. Olomana Orchids, Inc., HI - Breeders & Growers of Blooming Dendrobiums! Only Orchids, CA - Offers unique orchid arrangements for the home, business & special events. Orchid Express & Leasing, TX - Orchids for sale/lease/shipping, retail/wholesale, arrangements/supplies and more! Orchid Inn, IL - Specializing in Paph and Phrag plants/flasks - update monthly! The Orchid Konnection, TX - Many new & exiting Phal. stems & mericlones for the Summer of 2003. Updated website! Orchid Magic, CA - Your source for all the plants grown by the Orchid Zone. From seedlings to select! Orchid Mania, FL - Wide Variety of Species & Hybrids! Orchid Paradise, CA - Specializing in Premium Quality Phalaenopsis! Orchidaceae, Inc., WA - orchids for the serious collector & casual fancier from species to the latest hybrids. Orchids By Tom, FL - Calanthe bulbs & Calanthe care! Orchids For The People, CA - Cool & Intermediate Orchids at Reasonable Prices! Orchids Limited, MN - Check out our Plant of the Week! Orchids-plus-more.com, MA - What's the occasion? Orchid plants can make it better! OrchidView Online - Premium Quality Phalaenopsis from H.P. Norton! Owens Orchids, LLC, NC - Growing & Selling Orchid Plants Since 1962! Pacific Orchid Express Inc., CA - Wholesale and Retail Orchids! Par O Bek Orchids, NY - Disa, Lycaste, Misc. Orchids, Carnivorous Plants! Peach State Orchids, GA - Atlanta's Place For Orchids! Phelps Farm Orchids Inc., FL - High Quality Catts, Paph, Oncidinae & Others! Philadelphia Houseplant Wholesalers - Orchids from Thailand! Phoenix Orchids, AZ - Fine Quality Phal Stem Props from Eric & Mary Goo! Pine Ridge Orchids, FL - Specializing in superior quality Phalaenopsis & Paphiopedilums! Piping Rock Orchids, NY - The Source for Quality Paphs and Phrags - Winter 2004 - Summer 2007 Catalog Now On-Line! Porters Orchids, MI - Quality orchids for the home environment! Quarter Acre Orchids, VA - Clear pots, butterfly clips, washed coconut husk. Free delivery to NCOS meetings! Quest Orchids, FL - Specializing in Cattleyas! R. F. Orchids, FL - Online Catalogue! R. K. Gems, Orchids & Tropicals, MN - Phrags, Paphs, Phals, Catts, & other Genera - Mature plants, Seedlings, Flasks! Raising Rarities, OH - Specializing in Cypripediums, Rose Pagonias and Calopogans! Ratcliffe Orchids, FL - Paphiopedilums! Rick's Tropica, FL - Specializing in Species Jewel Orchid & Dendrobium & Other Uncommon & Rare Orchids! River Valley Orchidworks Inc., AR - Excellent plant selection, online catalog and sales, grower forums, 3D chat! Riverbend Orchids, MS - Newly Designed Site! Rome's Orchid Nursery, OR - Updated catalogue. Specializing in species, Paphs, and unusual hybrids! Leo Schordje, IL - Phrags, Paphs, orchids, bamboo, bonsai & bonsai pots! Seagrove Orchids, NC Phrags, stem props, mini cats & misc hybrids &species! Seal Rock Orchids, CA - New for 2004, Species Compots. Many miniatures, and specialty species. Sentinel Orchids, PA - Cattleya family specialists & many other fine genera! Newly updated 4/30/03!! Sequoia Orchids, CA - Specializing in Cymbidium, Odontoglossum & Miltoniopsis 3 1/3 & 6" liners at wholesale pricing! Silva Orchids, NJ - Seedling & Mericlone Species & Hybrids! 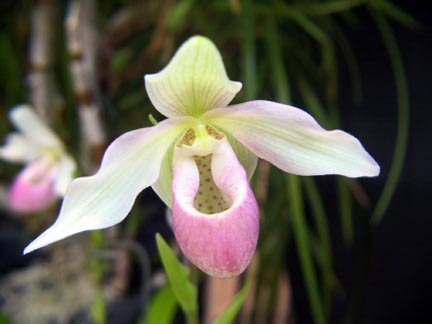 SlipperOrchid.com, IL - Private grower specializing in Paph & Phrag Orchids in flask, compot, & seedling to blooming size! SLO Gardens, CA - 1000 + Species, Monthly Specials, Oncidiinae Hybrids, Compact Catts, Wholesale Available, Photos, Reasonable! Sorella Orchids, WA - Specializing in Asian Species & Vandaceous Hybrids! South Pacific Orchids, Inc., CA - Specializing in Phalaenopsis, Dendrobium & Lucky Bamboo! South Shore Orchids, NY - Large selection of Paphs & Phrags, some Mini-Catts, Masdevalias & Companion Plants. South Star Orchids, FL - Wholesale Phals, Cymbidiums, Oncidiums! Stewart Orchids, MS ... like an old friend! Updated monthly! Stony Brook Orchids, NJ - Fine Phalaenopsis! Strawberry Creek Orchids, CA - Devoted to Odontoglossums & Oncidiinae Alliance Hybrids inc. Cyrtochilums. New pictures & listings monthly! Sunset Valley Orchids, CA - New hybrids in the Catt, Paph, Phal, and Catasetum alliance. New listing! Sunshine Farm & Gardens - Spiranthes, Tipularia, Goodyera & Aplectrum! Tropical Orchid Farm, HI - Uncommon, well-grown orchid species at reasonable prices! TropicalBloom.com, TX - Specializing in high quality seedlings of all types! Vermont Ladyslipper Company, VT - Specializing in Lab Propagated Cypripediums! Vintage Orchids, CA - Specializing in Paphs, Phrags, & Other Interesting Species & Hybrids! Waldor Orchids, NJ - Largest Supplier of Orchid Plants in the Delaware Valley! Whippoorwill Orchids, AR - Paphs & Phrags! White Oak Orchids, CA - Specializing in the Wierd & Wonderful! Wild Orchid Company, PA - Source of Perennial Terrestrial Orchids! Wildmoor Orchids, HI - Own the Splendor of Maui grown Orchids! Windy Hill Gardens, MO - Featuring Top Quality Phrags, Paphs, Bulbophyllums, & Others! Winterview Orchids and Supplies - Chinese, Japanese, Korean & Other Asian Orchid pots! Woodland Orchids, NC - Specializing in Odont/Oncidium Alliance & Mexican Species! Woodstream Orchids, MD - Specializing in Paphs, Phrags, Lycastes, Epidendrums, New World Species! Yamada's Orchid Nursery, HI - Specializing in Epidendrums!